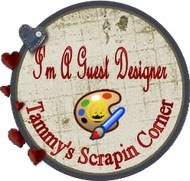 This week at Hiding in my Craft Room we are digging into our stash for our Super Scraps Saturday Challenge. 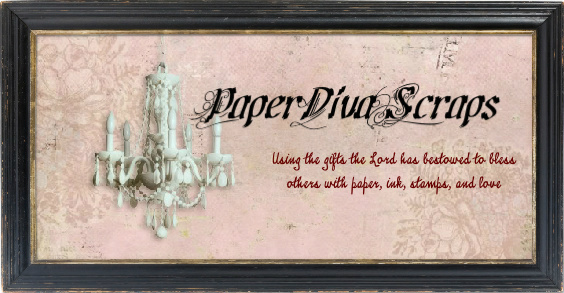 Our sponsor this week is Scrapbookpal.com who have so generously offered a $25.00 gift certificate prize! 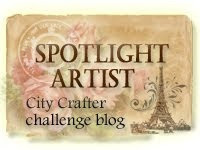 The contest runs for one week and this is one challenge worth diggin around in your scraps for! I don't know why I don't do this more often since you can really pull a card together rather quickly, especially if you find some pre-stamped papers as I did. The background paper had been embossed with a Spellbinders 5x7 embossing folder and was smeared with a lot of Tim Holtz Distress Ink in cut grass. The craft paper was stamped with a Ranger texture tread (normally used with wet hot UTEEZ, to create a dimensional, texturized embellishment). A Basic Grey rub on was placed onto the stamped piece...I found the Life is Beautiful stamped sentiment from Inspired By Stamping in the pile as well as the striped paper. 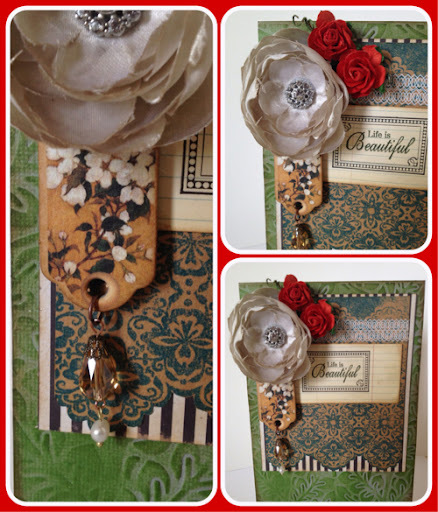 I added a G45 BirdSong chipboard piece and attached a crystal, as well as a Jolee's satin flower and a couple of red I am Roses and Voila, a card is born! A chance at that $25.00 Scrapbookpal.com prize! Beautiful card. Love the flower. This is just so beautiful and classy. Love the kind of vintage feel to it. This is awesome sweetie. Gorgeous flower. 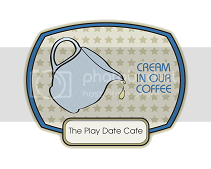 Thank you so much for sharing it with us at Totally Papercrafts. Great card. Thanks for playing with us at Simply Create Too. You took to heart the instructions and have turned out this very pretty card. WOW, this is really a stunning card. The colors and textures are so rich and deep. 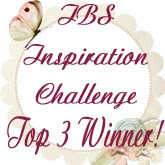 It's very inspiring and beautiful, and I really thank you for stopping by to share it with us in this week's challenge. It's a blessing to have you share with us. Beautiful card! Such gorgeous flowers! Thanks for joining us for the Simon Says Stamp Challenge! Gorgeous card. Great colors. The flowers and the embossing are really pretty too. Thank you for joining us over at Whimsical Designs. Wow--love that satin flower! Thanks for playing along with our LACE challenge over at LRW!! 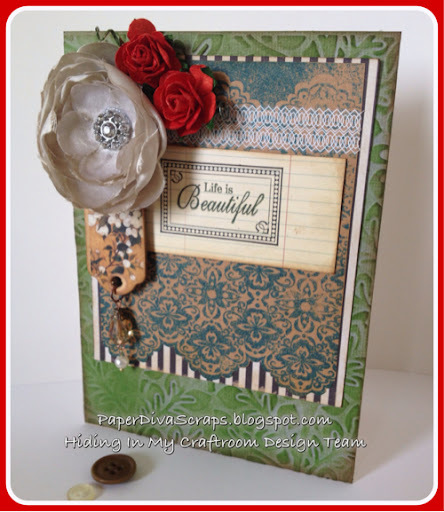 A wonderful creation with those embossing and awesome flowers. Fabulous work! Thanks for blessing us with your project this week at Word Art Wednesday...Have an awesome day! Great card. I love all the details. Thanks for joining us at Whimsical Designs. Oh, I love everything about this fun project! And what an amazing sentiment. I am such a sentiment freak and this sentiment is so touching. 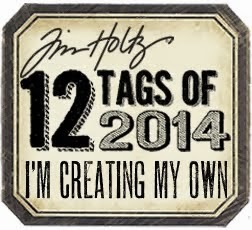 Thanks so much for joining our challenge at Shelly's Images Blog. So wonderful! I love the big flower. 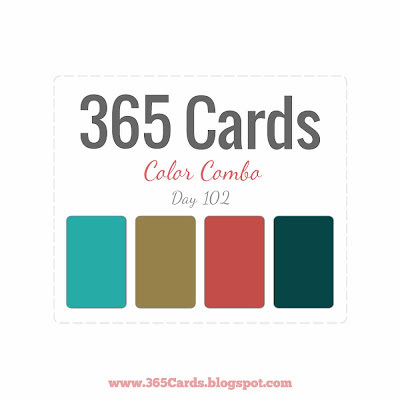 Thanks for sharing at Card Crafter's Circle! i meant "you have here" not "you have her", lol....sorry!